SpinPlant carries out R&D projects with a Nano-Spider manufactured by Elmarco. The company Elmarco, located in Liberec, Czech Republic, is the world market leader for electrospinning production units. 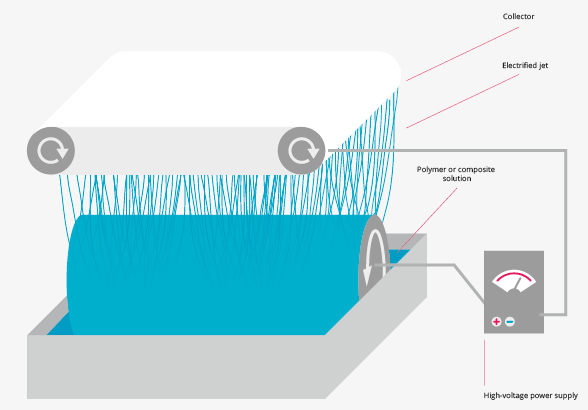 The proof of concept to SpinPlant’s approach to the production of collagen fibers on a nanoscale was achieved with the Nano-Spider. Therefore, SpinPlant continues its R&D work with the Nano-Spider. In 2014 SpinPlant entered into R&D cooperation with the Translationszentrum für Regenerative Medizin (TRM) at Leipzig University. SpinPlant’s laboratory is established at the TRM. In a joint research project SpinPlant benefits from the resources of the TRM, notably the local GMP facilities. The Forschungsinstitut für Leder und Kunststoffbahnen (FILK), located in Freiberg, Saxony, is a leading research institute for collagen and SpinPlant’s partner in collagen chemistry since 2014. Together with our R&D partners we have successfully filed for several joint research projects, such as PtJ/BMBF and ZIM/BMWi. SpinPlant developes a unique BioMesh/BioYarn consisting of collagen and cross-linking materials, produced in an electrospinning process on a nano basis.